PHOENIX -- An Arizona state lawmaker was seen telling a sheriff's deputy he sometimes drives as fast as 130 or 140 mph after he was pulled over for speeding. The deputy said in a report later that the driver claimed to have legislative immunity. State Rep. Paul Mosley was stopped on March 27 outside of Parker, Arizona. The rural area near the California border is in Mosley's district and more than 150 miles west of the state capital in Phoenix. A body camera video obtained by KLPZ and first published on its website ParkerLiveOnline.com shows a La Paz County Sheriff's deputy warning Mosley to slow down. Mosley was going 97 mph in a 55 mph zone on state Route 95, the news outlet reported. Mosley then says he sometimes drives "130, 140, 120," while trying to get home to surprise his wife. He says he doesn't notice the speed because of his vehicle's nice wheels and suspension. The deputy's written report said Mosley told him not to waste time on the incident because he has legislative immunity, KLPZ reported. "I don't break the law because I can, but because, you know, I'm just trying to get home," Mosley says in the video. Mosely on Thursday posted an apology on his Facebook page, referring to the comments to the deputy as a joke. "My desire to get home to see my family does not justify how fast I was speeding nor my reference to legislative immunity when being pulled over," he said. He said his comments to the deputy were inappropriate and showed bad judgment. While the state constitution does provide for certain kinds of legislative immunity, elections lawyer Kory Langhofer told CBS affiliate KPHO-TV it exists only to protect lawmakers from missing votes during the legislative session because they happen to be arrested on a minor legal matter. "It is a big no-no to claim legislative immunity to get out of a speeding ticket," Langhofer told the station. "It really is just a shameful thing. It also doesn't work." A document from November 2002 shared by the House Rules Committee says speeding tickets - as well as violations for driving under the influence - aren't covered. 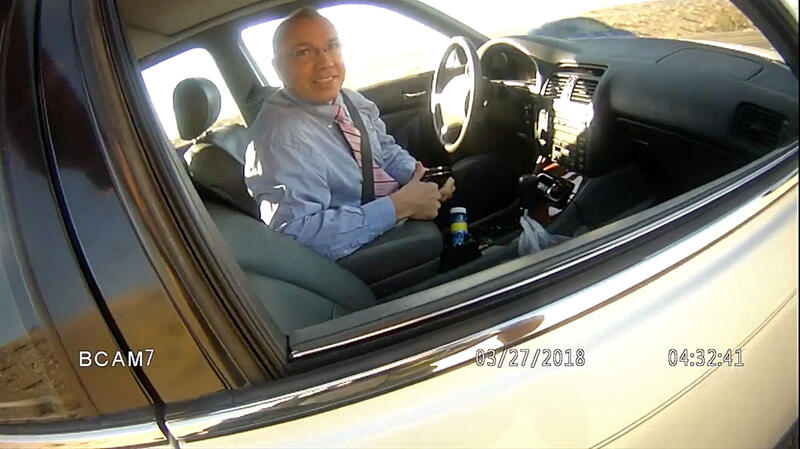 The video does not show the deputy, who was not identified, issuing a speeding ticket, but the incident is under review by Cochise County Attorney Brian McIntyre after the La Paz County Attorney's Office referred the incident to avoid a potential conflict of interest. McIntyre said in a statement a complaint has not yet been filed. "I do not believe the ethical rules permit me to say whether I intend to charge the matter or not, however," McIntyre's statement said. "I am able to say that it will be reviewed consistent with our ethical obligations and a charging decision will be made as time and resources permit." Speaker of the House J.D. Mesnard said he was "disturbed" to see Mosley's actions and doesn't think the immunity provision would apply. "Nothing short of an emergency justifies that kind of speeding, and assertions of immunity in that situation seem outside the intent of the constitutional provision regarding legislative immunity," Mesnard said. A search of court records in Arizona didn't immediately turn up any traffic violations issued against Mosley. Mosley, a Republican from Lake Havasu City, was elected in 2016; he is running for another two-year term in November. The Arizona Fraternal Order of Police withdrew its endorsement of Mosley and condemned his speeding. "Rep. Mosley's recklessness, his demeanor and his utter disregard for the safety of the public represent the exact opposite of what the Arizona Fraternal Order of Police looks for in an elected official," the group's president John Ortolano said in a statement. "Potentially lethal speeding isn't a joke. We will not stand with those who think it's acceptable or funny to risk the lives of others while behind the wheel of a lethal weapon."